Artworks illustrate a cultural reawakening. 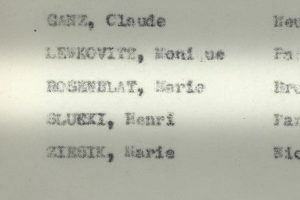 Exactly half a century after its exile from the Soviet Union in 1938 with the liquidation of Agro-Joint, the American Jewish Joint Distribution Committee (JDC) once again set foot on Soviet soil in 1989, amid the prevailing atmosphere of glasnost. Though a devoted few had risked everything to sustain a thread of Jewish life, the final collapse of the Soviet Union in 1991 revealed a Jewish cultural wasteland imprinted by 70 years of repression. JDC went to work immediately, revitalizing Jewish communal infrastructures and strengthening Jewish identity with a range of Jewish cultural activities. To that end, JDC trained educators, religious leaders, and communal professionals, and also built Judaic libraries, imported Russian-language Jewish books and materials, and supported Jewish schools across the region. 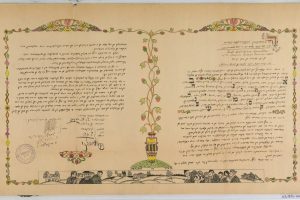 A physical manifestation of this cultural resurgence can be glimpsed in five colorful drawings of the Jewish holidays, created in the early 1990’s, by ten-year-olds attending the Moscow Jewish Art School. JDC sponsored the Jewish Art School, which opened in September 1990 with 100 students between the ages of 7-14. Its focus allowed Jewish children the opportunity to develop their talents in a Jewish atmosphere. These children were part of the first post-glasnost generation to receive a Jewish education in the former Soviet Union (FSU), and this school afforded them the chance to explore their roots creatively in the classroom. The opportunity to use their artistic gifts in a Jewish environment illustrates the new spotlight placed on Jewish religion and culture. Pairing an arts education with Jewish culture enabled children to embrace their background in personal, unique ways. This experiential education strengthened Jewish identity and overall connection to the community. 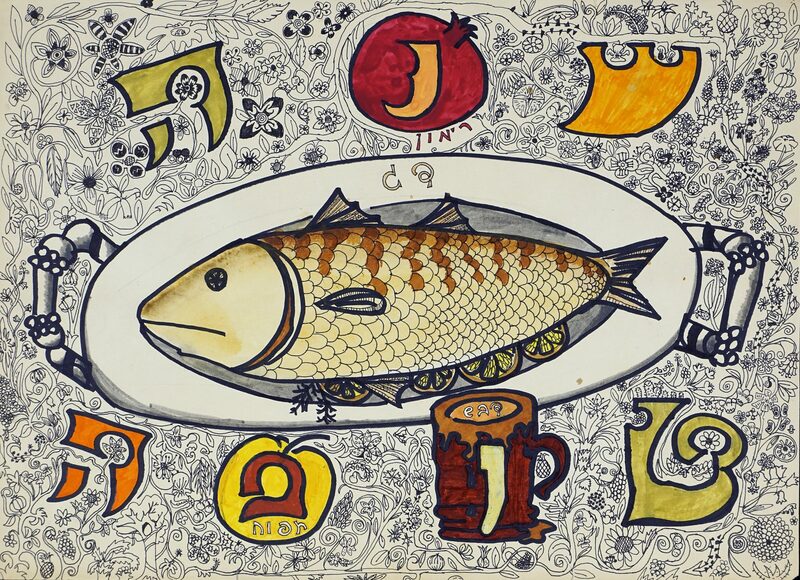 One drawing by Illarion G. represents the Jewish New Year. It features a large fish resting on a platter, surrounded by a tapestry of blossoming flowers and whirling garlands. Large Hebrew letters proclaim “Shana Tova” or “Happy New Year”. Holiday symbols can be spotted amongst the blooming background such as the pomegranate which embodies the hope that everyone can approach the new year with abundant merit as well as apples and honey, traditionally eaten to usher in a sweet new year. 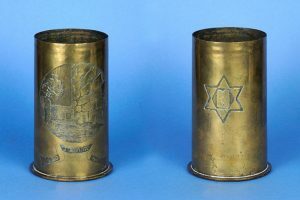 The breadth of symbolism relating to the holiday demonstrates an understanding of Jewish symbols and customs. Additionally, from the intricate scales of the fish to the immensely detailed floral background, the work exhibits intense precision and attention to detail, evidence of the effort Ilarion applied to his masterpiece. This same aptitude can be glimpsed in a watercolor by Roman B., in which urns of oil flank a menorah in a temple framed with columns lit by fire. A crowd of ornately dressed men enrobed in cloaks and holding scepters watch the lights flicker. 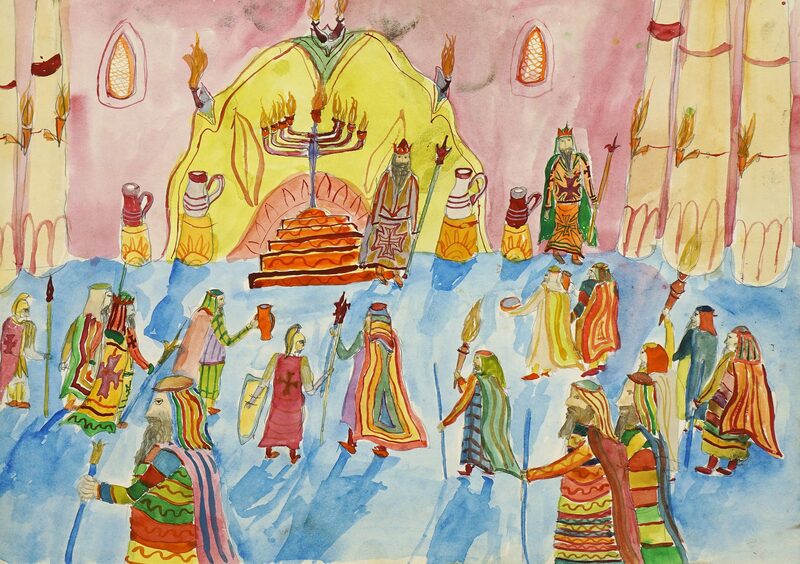 The piece, which appears to be a scene from the story of Chanukah, is full of bright, vibrant colors. The overall workmanship, with its focus on shade, shadow, and perspective illustrates concentration and care, indicating that the art was executed with great pride. These works of art stand as a testament to the integral educational and arts programs JDC helped to support in the FSU. They symbolize the sentiment that it is never too early or too late to connect with one’s heritage. JDC continues to offer guidance and expertise in rebuilding needed services and infrastructure which help Soviet Jews explore their roots and build community.